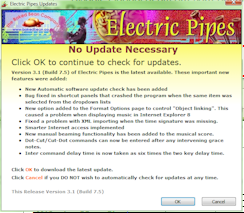 New licensing process deployed to overcome the problem of having to re-license Electric Pipes each time Windows performed an automatic update. After installing this version there should be no need to keep sending for a new license. Rests can now be moved on the staff in the same manner as notes. The rest hotspot handle is located below the staff line under the rest. Point the mouse in this area until the handle appears then drag it to a new location. Rests, by nature, only move horizontally. A new method is being trialed for manually moving notes on the staff. Point the mouse at the note head until the handle appears. Press and hold the left mouse button until the "hand" appears then move the mouse either vertically or horizontally to fix the direction of movement. Once fixed the note only moves in that direction until the mouse button is released. The old method, which was to hold the Alt key down while moving the note, still works and still allows the note to move in any direction. Pressing the Alt key after the initial movement of the mouse will unlock the first movement direction and allow the note to move in any direction. Notes can now be selected in groups and moved horizontally along the staff between the adjacent notes bounding the group. This also works for the selection of a single note but single notes cannot be moved vertically using this method. Fixed a problem with MusicXML imports that resulted in a tune all on one line. This is a correction release only. It incorporates the same changes as Build 7.7, which was linked with the wrong library. Problems fixed where option changes to multiple part staves changed the staff type incorrectly. Suppressed the drone playing at the start of a tune that starts with drum rolls. This involves the use of hidden rests. Problems fixed with starting multiple part playing. Addressed problems with ending Electric Pipes while the program is playing. This caused problems asking that playing had to be stopped before exit even though playing had already stopped. This made it impossible to exit the program. Editing multiple lines in text fields has been modified. To enter a new line when editing text in the title block fields, use Shift+Enter. The characters \n still work. Fixed a problem with XML importing when the time signature was missing. 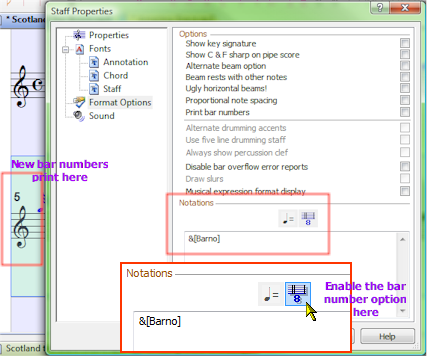 New manual beaming functionality has been added to the musical score. 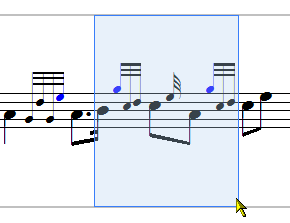 To reset the beam, move the mouse between the two notes to join and a transparent beam will appear. Click the left mouse button. 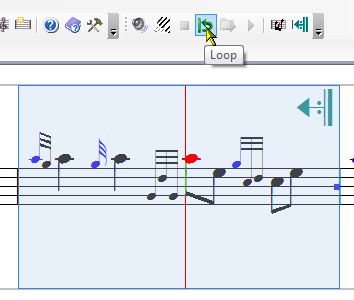 Dot-Cut/Cut-Dot commands can now be entered after any intervening grace notes. Inter command delay time is now taken as six times the two key delay time. This is a patch release to fix a bug in the Loop playing routines. The program lost time with the metronome at the beginning of each loop..
Added two extra command buttons to the play bar that play loops ignoring repeats. "Ignore Loop" and "Ignore Repeat" Full details of how these work can be found in the online help. This is a patch release to fix a bug in the Sample editing functions. The program failed to update the sample file correctly whenever a sample was moved up or down the list of samples. The base module has been increased. It now includes all sample types, the keyboard map, and the multi-part module. There is no longer a need to purchase each separately. The base price has increased to reflect these changes. The remaining module price has been increased. These changes appear on the Registration screen shown below. A new "Upgrade" option has been added to make it clear what is being registered. If you didn't have any of these modules at version 3.0 or earlier, they now become available to you at this release, FREE!. 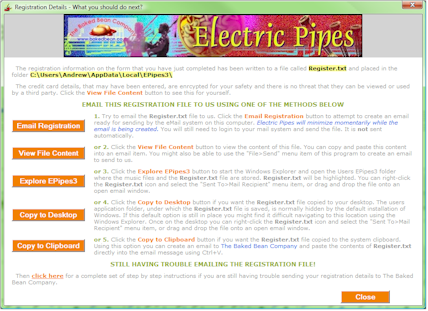 An Electric Pipes project file has been implemented. It has the extension .epj and will save the appearance of the last session including docked bars and tab groups including tune files and "Most Recently Used" file list. There is an option to have "last project used" loaded at start time. Other staff option has been implemented allowing instruments with up to 3 octaves to be played. Organ samples included. 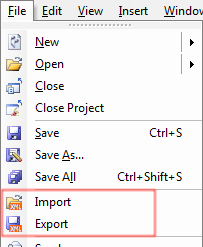 Support has been added for the Export and Import of MusicXML file format documents. This is an extensive music exchange format that allows programs to share music files. It has been supported in Electric Pipes to make it possible to scan sheet music with a scanner which is then saved as MusicXML and imported into Electric Pipes. There are also options to scan PDF format files and turn them into MusicXML for import. The scanning program, ShareEye, is available from http://www.visiv.co.uk/. The PDF program, PDFtoMusic Pro, is available from http://www.myriad-online.com/. 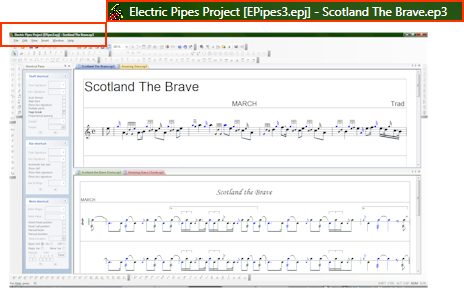 Download this beta version which works better for bagpipe music. There are still a few issues with this that the author is working on. Both programs are available in evaluation versions so they can be easily tried for effectiveness without cost. Added extra toolbars making most commands accessible from a tool bar. The toolbars can be docked against any border of the main window frame or dragged off the frame and floated if necessary. The object selection method has been modified and improved. There is now an option in the "Preferences">"Format Options" page to change the selection from the default "rubber band" method to the v2.1 highlight method. (Use alternate selection method). Selected text can now be highlighted with a translucent blue. These selection methods can be reversed temporarily by holding down the "ALT" key prior to making a selection. The Registration process has been modified to provide more functions for sending the Register.txt file to the Baked Bean Company. Because the user application data area is by default in a hidden folder (don't ask why) it has proved difficult for some users to find the registration file for emailing to us. 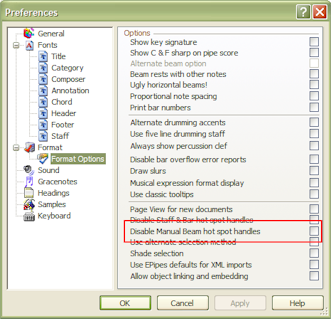 These options make the file easier to find and manipulate. This window appears when the OK button is clicked on the Registration process. Accessed from the Help>Register menu item. The Integrity check option has been added to the View menu and to the tab context menu. The Integrity check has been made into a global command which affects all documents and will be saved between sessions. Open last tune option has been changed to open last n tunes. Up to 9 of the last tunes can be opened when the program starts. Added a 'minimum top space above the staff' option to simulate the behaviour of v2.1's line spacing. This value has a default in the Preferences/Format page and is saved with every staff line. The bar numbers have been moved to accommodate the minimum space setting. They now appear above the treble clef and are not in a box. Numbers or letters put in a box are rehearsal numbers not bar numbers. A new option has been added to the General Preferences page. It is Continue playing next document which if set the player will cycle through each document playing each one in turn. 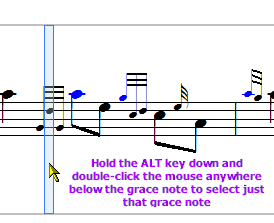 Holding the ALT key down will override the grouping of grace notes when clicking mouse to move the cursor. 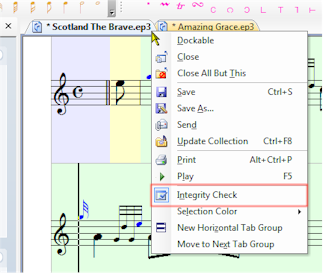 With the ALT key still down, pressing F2 will select the single grace note. The player loop (playing selected objects) has been fixed to play only what is selected. It ignores variations and repeat bar lines. This makes it easy to play straight through a tune without following the variations and repeats. Select the whole tune and click the "Player Loop" button. 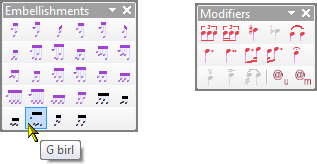 The Preferences Format page has been split into two pages and new options for alternate drumming accents, use of a five line drumming staff, and show the percussion clef sign have been added plus many other format related options. The tune player has been modified to be a bit less rigorous when checking the playing sequence. Use of left-repeat bar signs is now no longer required. However this should not make the use of these bar lines obsolete as, for good engraving, they should be present on the score. The file dialog box opens in the last folder that was opened. 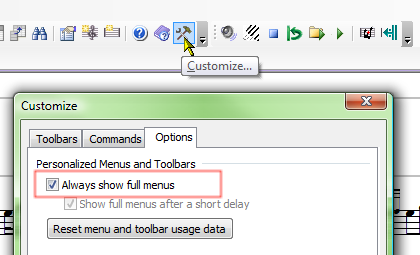 This feature can be turned off temporarily by holding the Ctrl key down while selecting the File>Open menu item or the Open tool bar button in which case the dialog opens the folder of the currently active file. The file Save As dialog box normally selects a file name based on the first tune title in the document. This default feature can be turned off temporarily by holding the Ctrl key down when selecting the option. In this case the current file name is used instead. The menu display has been set to show all commands by default. There has been some confusion with this option as it hid commands like "Page Setup" that users could then not find. If you want the menus to hide run the Customise Menu and select the Options tab. Turn off the "Always show full menus" option. Text problems using HTML format have been addressed. The HTML is now more reliable. The text fields in the Header & Footer dialog and Title sections have been enlarged to make it possible to enter large amounts of HTML for special formatting. The custom header and footer dialog now has an option to display fields horizontally or vertically. The option to resize a staff line to have equal width bars (Shift+Enter) has been modified to not include empty bars in the resizing. A feature has been added to remember the last cursor position when a file is changed which is restored when the file is reloaded. This uses the "Most recently used" file list. The "Continuous looping of tune when played" option has been removed from the General Preferences page. This was an old option made redundant by the "Repeat" toolbar button. Fixed problems found with the auto-advance option and user defined keyboard shortcuts. Some general bug fixes have been implemented for problems that surfaced during the adding of new features. Fixed problems with the sequence of multiple documents playing in tabbed groups. Fixed bug that caused Electric Pipes to crash when setting a variation using the SHIFT-left arrow shortcut keys to select the first note on the staff. Fixed problems with multiple key assignments in the keyboard mapping routines. Fixed problem in the sample option that prevented a sample being loaded under Vista. Fixed a few bugs in the keyboard shortcut routines. 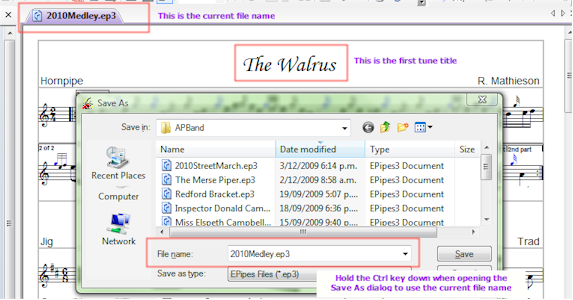 Fixed bug when saving file as ABC or EPM format when asked by dialog if user wished to continue saving tune as EP3. This question has been removed and the file is saved unconditionally. The menus for a docked window do not remain if the tabbed document window is empty. The workaround for this problem is to open a tabbed document of the same type if you want to edit a docked window. The tool bar works ok for a docked window though. The license update is not installed correctly on a 64 bit windows system. By default Windows installs 32 bit programs, of which Electric Pipes is one, in the special folder called "Program Files (x86)" and not the usual "Program Files" as is the case on 32 bit systems. To install the license correctly the default destination location that appears on the second screen of the installer MUST be changed to be "Program Files (x86)" and not the default that appears in the location field. Docked windows now load with their original contents between sessions. 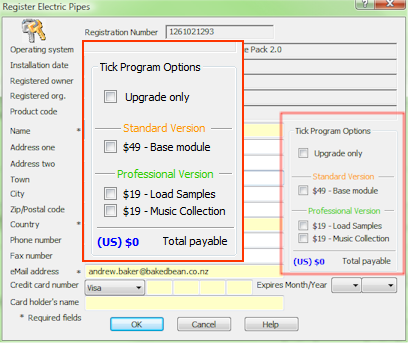 This makes it easy to create a temporary project and load the same set of tunes each time Electric Pipes is run. Problems with the uninstaller have been addressed so that Electric Pipes should be completely removed from the system upon un-installation. In keeping with changes that are being made to Vista security, the evaluation tunes are now placed in the user directory at install time and not in the Program Files area. This allows saving of these tunes without receiving an access violation error. It is now possible to save a collection file to a different folder and have the tune links remain intact. A bug found in docking a collection file has been fixed. A bug loading an incorrect .BWW file that caused Electric Pipes to crash has been fixed. 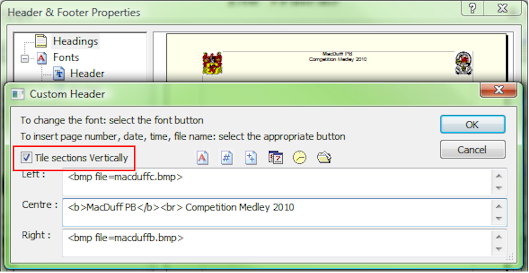 The filename has been added to identify duplicate entries in a tune collection. The "Register.txt" file template has been moved from the "Program Files" folder to the user folder and the "Start > All Programs > The Baked Bean Company > Register Electric Pipes 3.0" item modified to point to it. A bug was fixed in the installer that prevented the sound file from being loaded if the install location was not on the C: drive. At the release of Windows Vista, Microsoft has implemented the "User Account Control" or UAC. The primary purpose of which is to prevent unauthorised access or modification to the system areas of your computer. This means that a program running from a User account cannot modify certain folders on the computer, viz "Program Files" and "Windows". "C:\Program Files\The Baked Bean Company\EPipes3\"
"C:\Documents and Settings\<your user account name>\Local Settings\Application Data\\EPipes3\"
If you discover what you think is a bug or think Electric Pipes can be improved please feel free to contact us at the addresses below.